Artists making music and touring over the span of four decades is rare – let alone a band that (for the most part) stayed together, never really took a hiatus, and kept on making music that consistently made its way up the charts and had solid sales. Today’s band has done just that and sells out nearly every show they play. Back in the early 1970s a group of guys were forming bands left and right, trying to find the right mix to hit the bigtime. In 1974 a band called Mudcrutch signed with Shelter Records and moved to Los Angeles. They released one single in 1975, it failed to chart and the group disbanded. The same core members then moved on to form a band called The Heartbreakers, and broke on the scene with their self-titled album that dropped in ’76 through the same label. Success in the U.S. was slow, but the band was a clear hit in the U.K. Thankfully, that popularity kept the band going—the label re-released a couple singles in 1978 which became Top 40 hits. After their second record went gold, Shelter was sold to MCA Records. Front man Tom Petty refused to transfer which led to a legal battle. In spite of the legal drama, the dust settled on the lawsuit and their third album Damn The Torpedoes was released in October 1979 under the MCA brand. Coming off solid success from the first two records, the expectations were high. The concern was quickly put to rest with the record peaking at #2 on the Billboard 200 and later Rolling Stone put it at #313 on their top 500 albums of all time. Critics raved over the record, calling it the “Tom Petty album we’ve all been waiting for.” Others lamented the timing, stating it would have been a number one album easily if not for the mass acclaim of Pink Floyd’s ‘The Wall’ which was released around the same time. Petty would battle record execs again after the label increased the price of his albums to be $1 dollar more than most, calling it “superstar pricing.” To this day, he keeps prices lower at his shows to thank the fans who paid the extra for his records. Who doesn’t know Tom Petty? It’s one of those names that is in everyone’s mental file even if it isn’t necessarily the type of music you normally groove to. Personally, I have been a fan for years, but only owned his “Greatest Hits” record he released in 1993. I’m apparently not alone, because that album has sold nearly 20 million copies worldwide with his next best seller coming in around 10 million. 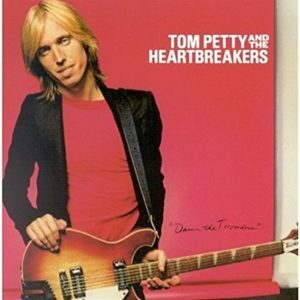 There’s a certain laidback rock style to Petty’s music that’s refreshing and different. It’s considered “heartland” rock, but it’s very different from Springsteen or a Bob Seger type. Maybe it’s a bit more blues and a bit more folk than those guys, but it works. Even with a few solo works and the Traveling Wilbury’s super group in the late ‘80s, the Heartbreakers always managed to work through it and keep going—and it’s hard to not respect that type of dedication. I’d definitely encourage you to see Tom Petty play live someday—he puts on a great show. But until he makes a stop in your town, start by picking this up for $5 bucks today. You’ll enjoy it and it’ll make your Tuesday go by a little faster. Happy World Wide Web Day!